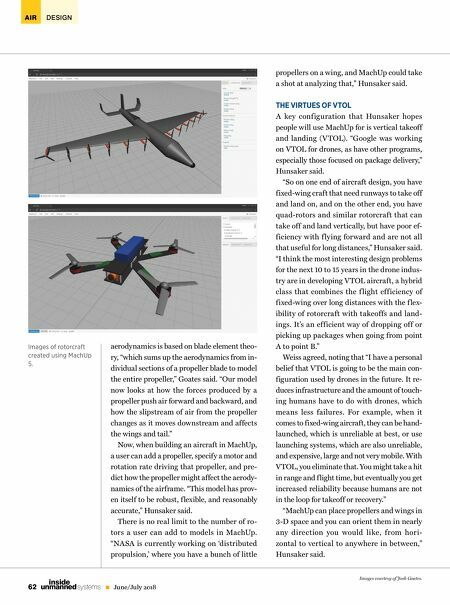 AIR DESIGN 62 June/July 2018 unmanned systems inside aerodynamics is based on blade element theo- ry, "which sums up the aerodynamics from in- dividual sections of a propeller blade to model the entire propeller," Goates said. "Our model now looks at how the forces produced by a propeller push air forward and backward, and how the slipstream of air from the propeller changes as it moves downstream and affects the wings and tail." Now, when building an aircraft in MachUp, a user can add a propeller, specify a motor and rotation rate driving that propeller, and pre- dict how the propeller might affect the aerody- namics of the airframe. "This model has prov- en itself to be robust, f lexible, and reasonably accurate," Hunsaker said. There is no real limit to the number of ro- tors a user can add to models in MachUp. "NASA is currently working on 'distributed propulsion,' where you have a bunch of little propellers on a wing, and MachUp could take a shot at analyzing that," Hunsaker said. THE VIRTUES OF VTOL A key conf iguration that Hunsaker hopes people will use MachUp for is vertical takeoff and landing (VTOL). "Google was working on VTOL for drones, as have other programs, especially those focused on package delivery," Hunsaker said. "So on one end of aircraft design, you have fixed-wing craft that need runways to take off and land on, and on the other end, you have quad-rotors and similar rotorcraft that can take off and land vertically, but have poor ef- ficiency with f lying forward and are not all that useful for long distances," Hunsaker said. "I think the most interesting design problems for the next 10 to 15 years in the drone indus- try are in developing VTOL aircraft, a hybrid class that combines the f light efficiency of fixed-wing over long distances with the f lex- ibility of rotorcraft with takeoffs and land- ings. It's an efficient way of dropping off or picking up packages when going from point A to point B." Weiss agreed, noting that "I have a personal belief that VTOL is going to be the main con- figuration used by drones in the future. 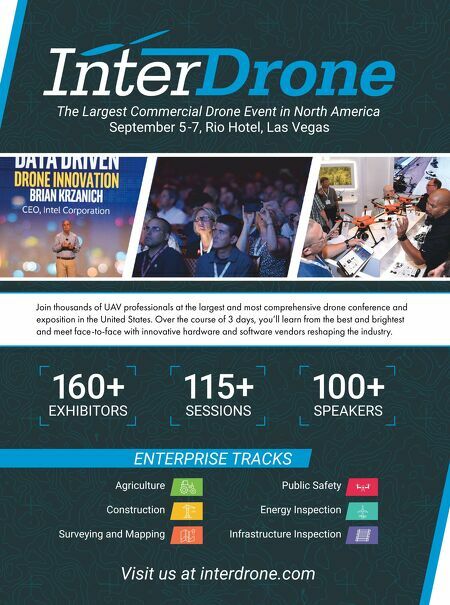 It re- duces infrastructure and the amount of touch- ing humans have to do with drones, which means less failures. For example, when it comes to fixed-wing aircraft, they can be hand- launched, which is unreliable at best, or use launching systems, which are also unreliable, and expensive, large and not very mobile. With VTOL, you eliminate that. You might take a hit in range and f light time, but eventually you get increased reliability because humans are not in the loop for takeoff or recovery." "MachUp can place propellers and wings in 3-D space and you can orient them in nearly any direction you would like, from hori- zontal to vertical to anywhere in between," Hunsaker said. Images courtesy of Josh Goates. Images of rotorcraft created using MachUp 5.